Thursday morning. Caught early flight from Don Muang, Bangkok’s original, but now secondary airport. 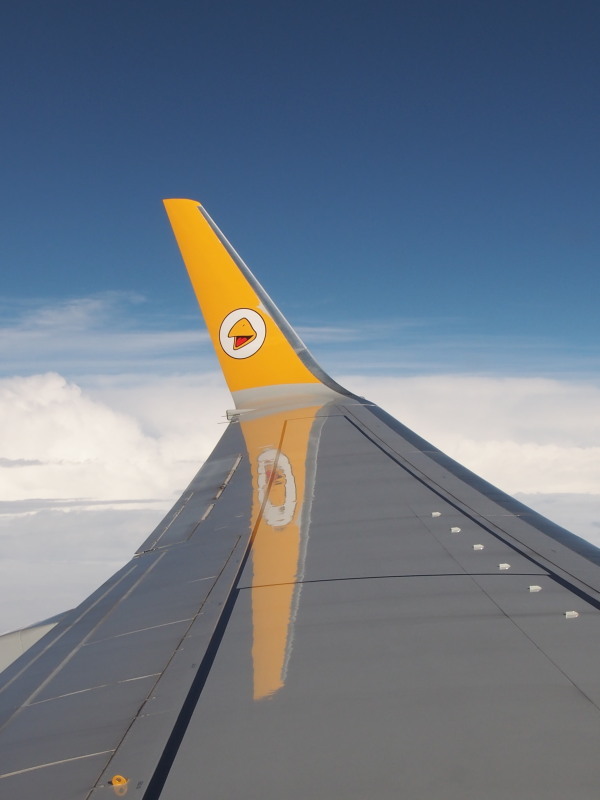 First time flying with budget airline Nok Air. Good service, quick check-in, friendly smiles. 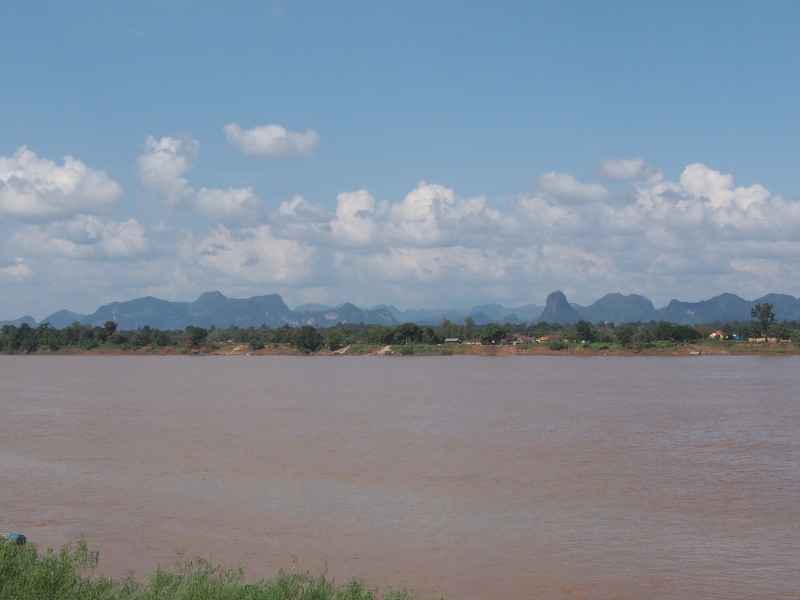 The alternative – a 12 hour bus ride to Nakhon Phanom – wasn’t an option this time. Don Muang would give main airports in many other cities a run for their money, in size and passenger numbers. There’s a coffee outlet and restaurant/cafeteria. Entering Departures American chains like Subways, Starbucks are the choice. There are no moveable walkways so don’t leave it till the last moment before boarding – you might need to walk further than you expect. We taxied under cloudy skies and terrential rain. Apparently a Typhoon in China had sent down weather I’d been told would last four days. I had a seat by an exit door which, according to the information sheet, was a position of great responsibility only qualified people should occupy. The hostesses gave ‘live’ take-off instructions; seemed quaint but actually focused attention better than the video screen variety. Though when the hostess nearby gave advice about commanding the exit position I couldn’t hear or understand a word she said. Hoped the stormy weather wouldn’t cause a forced landing. But we eventually rose above the clouds to clear skies. There was more than ample leg room. It should be the other way around though …more leg room on long haul flights, less on short routes like this one. Kanom (a sweet snack) and water were the complimentaries. The tea/coffee trolley went past so quickly you needed to call out to take advantage. 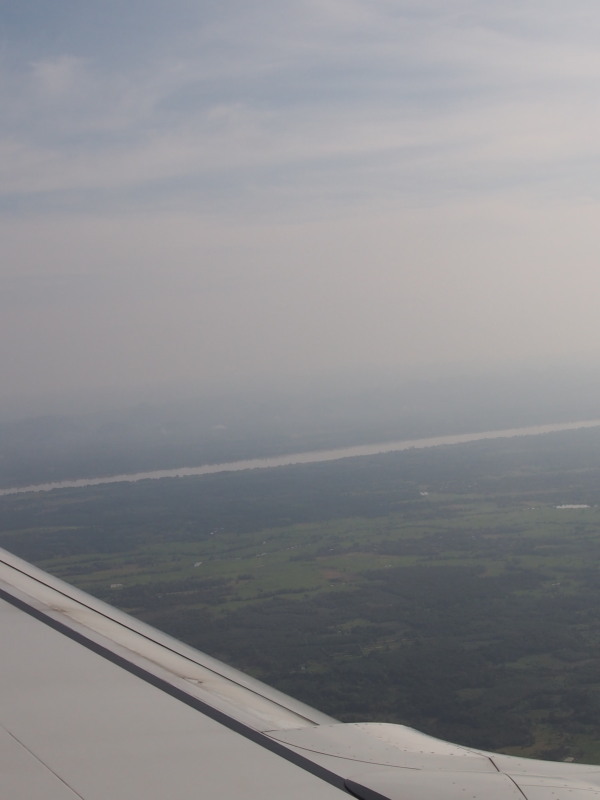 The weather was clearing by the time we got to Nakhon Phanom. 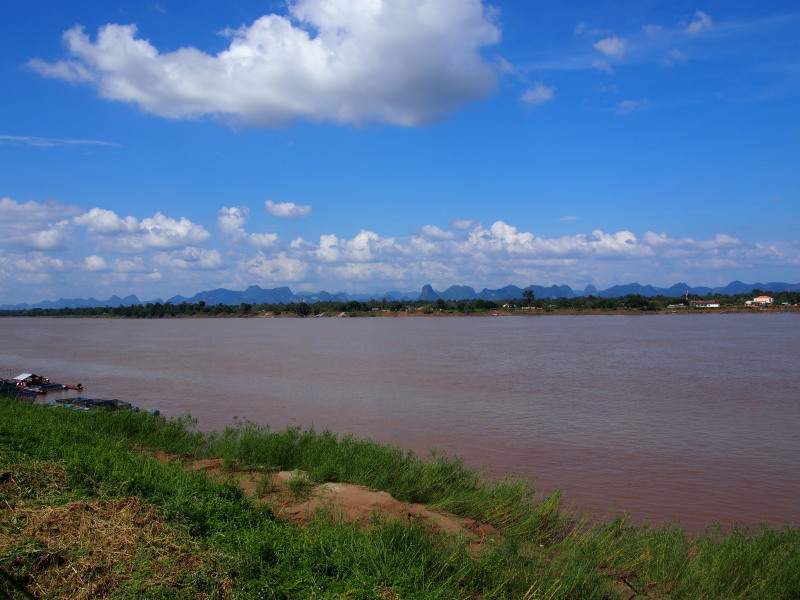 Perhaps the mountains in Laos provided shelter from the China typhoon? A good flight. 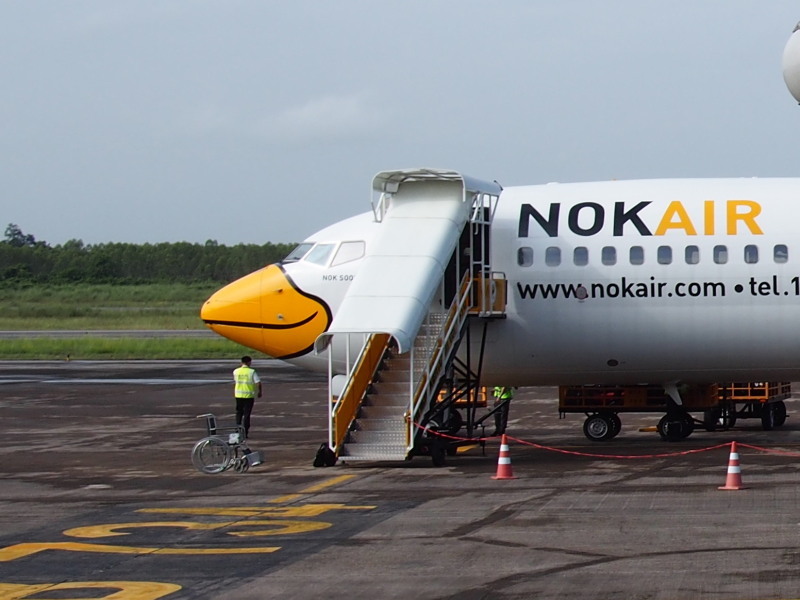 Thai Airways has serious competition. 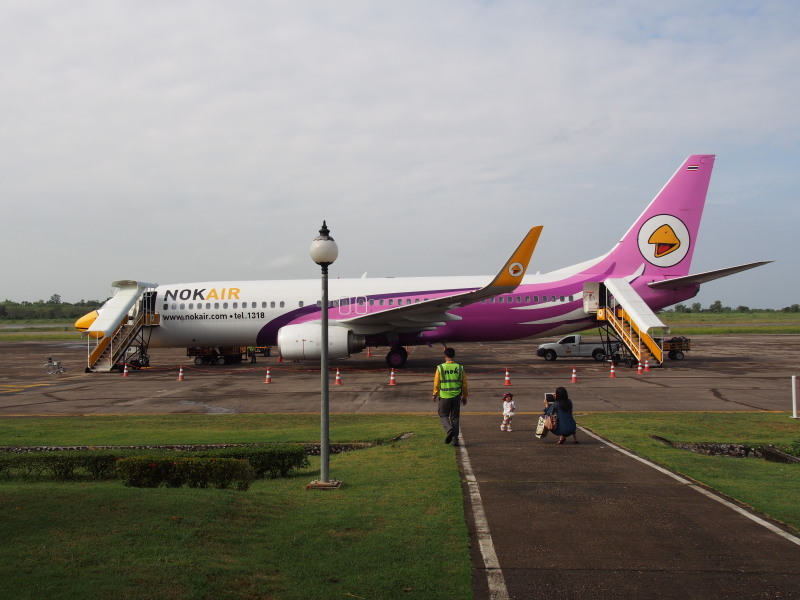 Nakhon Phanom receives two commercial flights per day; this one by Nok Air, and one by Air Asia. 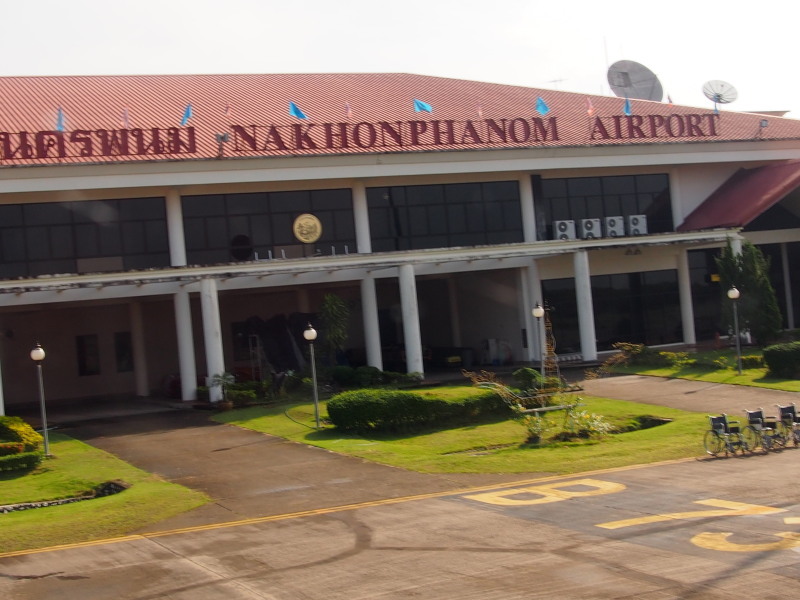 The airport is also used by the Royal Thai Navy. Like many airports in North East Thailand the runway was built by the Americans during the Vietnam war. For 100 baht a minibus transports passengers to their hotel. The normally quiet streets of Nakhon Phanom were busy leading up to the weekend’s festival finale. Intentions to rent a motorbike were stymied by a hefty price and the indifferent attitude of staff at the Honda dealership in Bamrung Meuang Rd. So I walked it to theTourist Authority of Thailand (TAT) office to find it seriously lacking information in English – about the festival and generally. Unfortunately I had ditched my English version of the North East Thailand map in Bangkok because I thought Nok Air’s 15kg limit included hand luggage and wanted to lighten my load. Another story. Market stalls lined the river. Finally blue skies above the mountains. 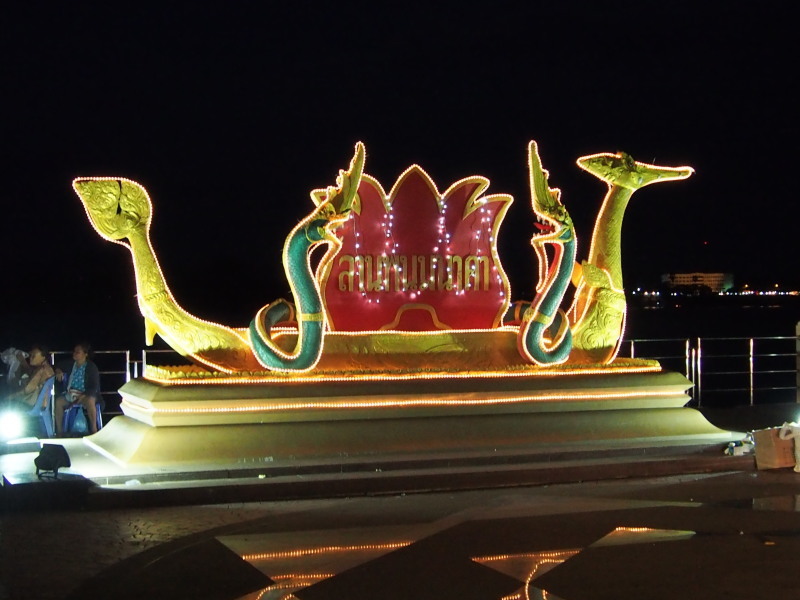 A statue of the Naga (a spiritual serpent believed to reside in these waters) lit up for the festival. Lai Rua Fai reaches its peak on Saturday night when ‘fire boats’ are launched along the Mekong. It’s one of many festivals around here celebrating Ork Phansa, the end of Buddhist Lent. In Sahkon Nakhon, 100 kilometres west, they parade wax castles. The Naga fireball phenomenon is mainly seen upstream nearer Nong Khai. Tomorrow Nakhon Phanom, as part of its festival, will hold the traditional boat races.